It is stupid of the Bush administration to expect the Iraqi people to abandon their country to Halliburton or Exxon-Mobil. But that appears to have been forced upon them. It is a recognized principle of international law that citizens have a right to take up arms against forces of aggression and occupation. Even America's delusional right wing must know that. The Americans had not brought what they'd promised: a new order. The war wasn't over, Iraq had no government, the liberators had become occupiers, and the occupation was slapdash, improvised, and inadequate-at best, a disappointment, and more often an insult. So, in the fever heat, month after month of a hundred and ten and a hundred and twenty degrees, alienation set in. Frustration gave way to hostility, hostility gave way to violence, and by summer's end the violence against Americans was increasingly organized. It was demoralizing. Every Iraqi might be the enemy. War crimes --wars of naked aggression --may be as unfair to the military forces required to fight them as to the victims of the aggression. 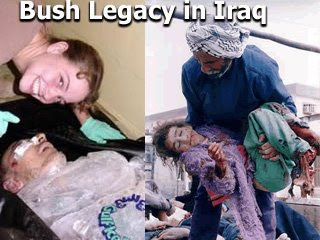 Still --it is the Iraqi people's whose homeland was attacked and invaded who have the moral high ground. We have every right to judge Bush by his record of war crimes and lies. We have every right to suspect that Bush is lying now to begin yet another 'resource' war against the people of Iran. Bush could never had gotten away with it, if he had not been assisted by a cancerous growth upon the body politic: the 'mainstream media'. And when discussing media consolidation, someone might tumble to the fact that NBC is owned by General Electric, one of the world's largestarmaments manufacturers in 2006 and among the six largest media conglomerates. GE makes and maintains engines for the F-16 Fighter jet, Abrams tank, Apache helicopter, U2 bomber, Unmanned Combat Air Vehicle (UCAV), A-10 aircraft and numerous other military equipment, including planes, helicopters, tanks and more. Is it reasonable to expect NBC to report critically on the status and duration of the Iraq occupation? Or is it predictable that NBC's occupation coverage will tell us that the "surge" is working, that US troop deaths are down, that the Iraqi puppet regime is gaining traction and, if we can hang on for another decade, things should turn out hunky-dory. Well, it's certain that extending the US presence in Iraq by a decade will have a very positive impact on GE's profit and loss statements. It's probably going to be somewhat less beneficial for the people who actually have to fight this insane proxy war on behalf of GE's bottom line. But that's okay, since war is the optimum business condition for many industries -- banks, weapons makers, raw materials suppliers, machine tool makers and so on -- GE looks to sell many billions of dollars more of its killing machinery, all the while telling Americans via NBC how peace is just 10 or so years down the road. And GE is just one of the main offenders. We'll leave for another day a discussion on how thoroughly Rupert Murdoch's News Corp. has polluted the national discourse. Or how the acquisitive tentacles of Viacom, CBS, TimeWarner and Disney have managed to take a relatively engaged population and, in 30 short years, turn it into a nation of compliant, ill-informed, politically illiterate chowder heads content to consume their quota of goods, services and ideologies with an equally uncritical eye.